Jackie Delane Aker was born July 13, 1940 in Tulare, California. The six foot two right hander, went to high school in Visalia California, where the Mets future farm team the Visalia Mets would play. Aker was originally an outfielder when he got signed by the Kansas City Athletics in 1959. He was converted into a pitcher the next year & won double figures over the next two seasons. By 1963 he was 6-1 with a 1.24 ERA at A ball Lewiston, getting pushed right up to AAA Portland. After going 3-4 at AAA Dallas the next year he was brought up making his MLB debut in 1964. He would spend four years in Kansas City with the A's then moved to Oakland with the franchise to pitch there in 1968. In 1966, he was voted the A.L. Fireman of the Year by the Sporting News, leading the league in saves (32) & games finished (57) going 8-4 while posting a 1.99 ERA. He fell to 3-8 the next year and his ERA rose to 4.30, although he still saved 12 games (seventh in the A.L.). In Oakland in 1968, he was 4-4 with 11 saves (seventh in the A.L.) 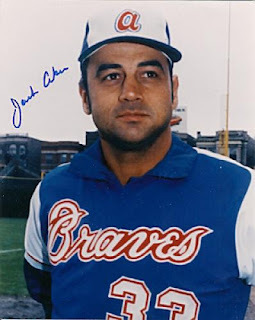 but then was chosen in the expansion draft by the Seattle Pilots. His stay was brief with the Pilots, but he did earn a save in the team's first game on April 8th 1969 at California against the Angels. He would go 0-2 with three saves, before getting traded to the A.L. New York team in mid May for Fred Talbot. Talbot was 1-9 the previous season. 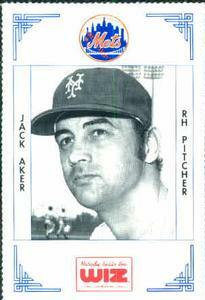 Aker remained in New York for 3 ½ years posting 16 saves in 1970 (ninth in the A.L.). Aker was in the league’s top ten in saves six times in the late sixties / early seventies and was one of the games better relievers. He was also very active in the newly formed Players Union and was the team Player rep. in both, Kansas City & New York. He was traded to the Chicago Cubs in 1972, that year his 17 saves led the club & were fifth best in the National League. He would come back to save 12 more in 1973 but this time was runner up on the team to Bob Locker. 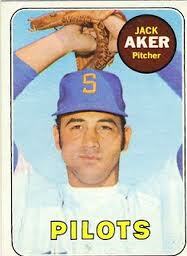 Aker was released by the Cubs & picked up by the Atlanta Braves in January 1974. That June the New York Mets purchased his contract. He was placed right in the Mets bullpen & debuted as a Met on June 16th pitching the 9th inning of a 7-1 Mets loss to the Dodgers. At the end of June he earned a win pitching two scoreless innings at his old park, Wrigley Field. Aker then earned a save on July 2nd at Philadelphia, & another ten days later at Dodger Stadium. On July 29th he would earn his last career victory, pitching two scoreless innings against the Montreal Expos in relief of George Stone & Bob Miller at Shea Stadium. At the end of August he strained his back & missed three weeks of action. He finished the year with the Mets at 2-1 with two saves, 18 strike outs, 14 walks and a 3.48 ERA in 41 innings pitched in 24 appearances. Aker finished his 11 year playing career at the end of that season, he was lifetime 47-45 with 123 saves, 321 games finished, 404 strike outs 274 walks and a 3.28 ERA in 746 innings in 495 games. Retirement: He remained in the Mets organization and went on to manage the Visalia Mets in 1975 near his hometown. Then he moved up to the AA Lynchburg Mets (1976-1980) winning the Carolina League Championship in 1978. In 1981 he moved up to AAA Tidewater (1981 -1982) winning the International League Championship in 1982. He was replaced by Davey Johnson. Aker went on to become pitching coach for the Cleveland Indians (1985-1988) then opened the Jack Aker baseball Academy to teach young children. He taught at risk Native Americans on reservations in 1997 and was honored by President Clinton for his efforts. In 2001 his wife won 25,000 on the game show “Who Wants To Be A Millionaire”. Today they are retired living in New Jersey, enjoying that money. Aker's 32 saves in 1966 was the single season record at the time.